Jude Kendrick, retired Army captain and owner of an auto repair shop, has spent over a decade putting the past to rest. After his fiancée’s brutal death, he never thought he’d risk his heart again. Then Paige Daniels walks into his garage. One look at her, and his black and white world bursts into color…until he realizes she’s dating his best friend, Sully. 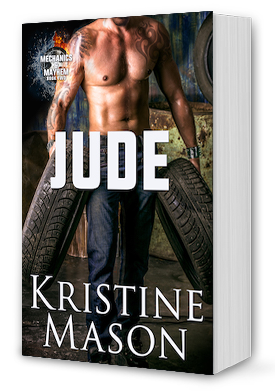 As Paige’s secrets unravel, Jude remains by her side. Although she’s fallen hard for him, their relationship becomes too much for Paige to handle, especially when her abusive ex-husband creeps back into her life. Can Paige and Jude’s love endure the sudden change in both their lives? Or will Paige’s ex get to her first? After all, he’ll do anything for revenge…even if it means murder.